We go to Richmond, Virginia, the home of Ralph Northam, and this is George. Great to have you, sir. Hi. CALLER: Rush, great to have you. I've been a student of yours for over 20 years. Thank you. RUSH: Well, thank you. I appreciate that very much. CALLER: Thank you for all you do. Trump should take the money that's been offered and start building this 55 miles of wall. While this is being built, start the plans for additional wall construction in Texas with the private landowners who want the wall. If Trump is challenged on a wall by private landowners in court, at least they'll be in a friendly court system. And my feelings are that Trump will get the entire wall built. He's the only person that could get this wall built and the best president we've ever had. RUSH: Well, let me tell you. That... Now, there's something worth pointing out here. I don't think... There may be some exceptions now on the Republican side who've seen Trump in action. But I don't think... Going back two years, there's not a single Republican that was on that stage -- all 16 of 'em running for office -- who would have built the wall. There's not a one of them right now that... If Trump were not on the scene, if Trump weren't elected, if he had been defeated, if he weren't wherever he is, there's not a single Republican that would talking about building a wall. The debate right now would be amnesty, and by now I'll wager that if Hillary Clinton had won the White House, we would have already had our comprehensive immigration bill for amnesty for 11 to 12 million and the flow continuing. There would be no discussion of a wall whatsoever. If Mitt Romney ever wins, the wall project is gonna get shut down. If anybody from John McCain wing of the Republican Party ever wins the White House, they're gonna shut down the wall, given circumstances as they exist today. The point being there isn't another option. If a wall -- and let's use the wall as a symbolic term for stopping illegal immigration, shoring up border security however. If a wall's part of it, fine and dandy. But my point is there isn't another Republican who's gonna spend anywhere near the amount of time or energy on this than Donald Trump. Nobody. Make sure... Ted Cruz would, but who knows if he's gonna run for president again. If he were in Trump's shoes, he probably would. But you couldn't fill up all five fingers on a hand naming Republicans who would follow through on something like this, and that matters. Okay. So here's George in Richmond: Take the deal, start the spending, start building the wall, and just keeping building the wall. Keep going back for more and more. He's Peggy in Visalia, California. Great to have you with us. Hi. CALLER: Hi there, Rush. So nice to speak to you for the first time. CALLER: Thank you. And I'm in Visalia, California, which is Devin Nunes's district. CALLER: He's my representative. Anyway, I wanted to get right on what I was calling about. I disagree with the last caller. I believe that the Democrats, they're willing to fund 55 of the 64 miles of border wall, which leaves nine miles open. Trump cannot agree to just because it's not a win and he's all about winning. RUSH: Well, let me tackle that. You know, that is a very sensible, very sensible point out there, Peggy. But let me put it through a different prism. By the way, this 65 miles we're talking about's the Rio Grande Valley. It's in Texas. Well, it's part of the Rio Grande area. It's not by no means the whole border. It's a specific portion, 65, 64 miles within 55 of which would be funded here. But you just said it. If the Democrats are only willing to fund 55 miles right there, do you have an effective commercial against whoever the nominee is in 2020? "Democrats: Only willing to fund 55 miles of border for border security. Democrats: Unwilling to help secure the border of the United States. Democrat Party: Unwilling to make America safer." I mean, the campaign ads are building themselves here, if you want to look at it that way. The question is, is it sensible to look at that way or is that, in some of your opinions, a cop-out? RUSH: William in Alpharetta, Georgia. Back to the phones we go. You're next. Hello, sir. CALLER: Hi, Rush. What an honor to speak with you. Mega dittos. RUSH: So you think he ought to just go and let the government shut down again? CALLER: Absolutely. All it did was I think teach some of the American people that they're not as dependent upon the government as they thought they were. And I think it's a good thing. RUSH: Okay. I gotta stop you there because I'm out of time. I appreciate it. Well said in such a short period of time. RUSH: There was last night at the Trump rally a new slogan introduced. And I think it is really, really relevant to where we are at this moment today. 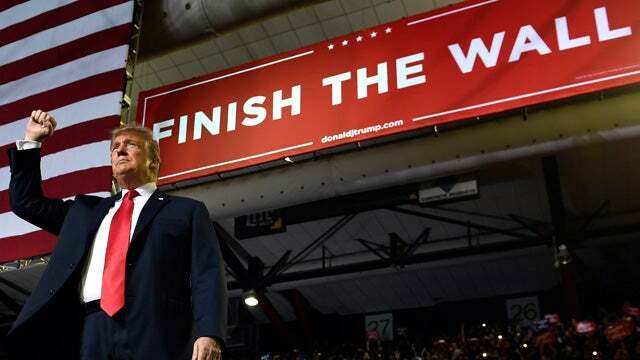 "Finish the wall" is the slogan. And there were "Finish the wall" banners hanging at the Trump rally in El Paso. You talk about an effective slogan, because it will remind people first that there are 600 miles of wall which was built under Bush 43 and Obama. By the way, how many people know that, do you think? I'm not sure that a whole lot of people know how much border wall there is. Especially for people that tuned in for Trump during the campaign 2015, 2016, they may think that the amount of wall, that we're looking at a 2,000-plus-mile border here, not all of it suitable for wall construction, but much of it is. But we have 600 miles of wall that was built under Bush 43 and even Obama. It will also remind people that Trump has actually been building new and better walls over the past two years. All he's trying to do is fill in the gaps that the Border Patrol say need to be filled in. It's a combination of official recommendations from the Border Patrol people who are the experts here who have to nab the illegals, and Trump's overall instinctive concern that something needs to be done to shore up the border. And so last night the Drive-Bys got triggered by this slogan. All Trump has to do is put up a sign and these people lose their cookies. So we have a montage here of all kinds of media people from last night and this morning over this new slogan, "Finish the Wall." ROBERT MOSES: “Finish the Wall” signs adorned the arena where the President spoke. CECILIA VEGA: The President was surrounded by these huge signs that said “Finish the Wall” right on both sides of him. CHRISTINE ROMANS: Some of those signs said “Finish the Wall,” moving the language. JOHN BERMAN: The banner reads “Finish the Wall.” Not build the wall, finish the wall. RICHARD GOODSTEIN: The sign behind Donald Trump, “Finish the Wall.” He's a fabulist. There is no wall to finish. LAWRENCE O'DONNELL: The new chant for the reelection campaign, Donald Trump wants it to be “Finish the Wall." RYAN LIZZA: The giant signs hanging from the rafters, “Finish the Wall.” The wall hasn't really been started, so I don't know what exactly he means. ABBY PHILLIPS: The big signs up there, “Finish the Wall.” It's extraordinary. RUSH: Now, the second-to-last voice you heard here was Ryan Lizza, "The giant signs hanging from the rafters, “Finish the Wall.” The wall hasn't really been started, so I don't know what exactly he means.” Ryan Lizza doesn't even know that we have 600 miles of wall. This is incredible. And Ryan Lizza is at CNN. He doesn't even know that we've got 600 miles of wall already, and, you know, it's hodgepodge. Trump wants to improve what we have and fill in the gaps! And so they were triggered last night, A, by the slogan behind Trump "Finish the Wall." Now, if you incorporate that slogan "Finish the Wall," it is a new slogan, how does that square if Trump signs this deal? Well, this deal authorizes 55 more miles of wall be built. As opposed to the previous bill which had zero in it. I'm struck by the overall amount here. Again, $1.375 billion is such a paltry, such a paltry number on this. I think, however, it is an indication of where Trump is on this. I don't detect in any aspect of Donald Trump's existence here any less enthusiasm to get this done. I don't get the sense that he thinks he's anywhere near accomplishing the objective or keeping the promise, and I think he's genuinely frustrated by the inability of Republicans to get a better deal out of the Democrats. And I know what people say, "But, Rush, but, Rush, he had the first two years, the Republicans had the House and the Senate." Look. I'm not constructing excuses here. And I mentioned this before. You have to keep in mind they weren't helping him do anything the first nine months. They weren't helping him repeal and replace Obamacare because a lot of Republicans thought Trump had colluded with Russia. There's no other way to explain Hillary losing! These are denizens of the swamp. They all thought Hillary was gonna win in a landslide. They were all gobsmacked. And so they were early believers in this whole made up conspiracy that Trump had colluded. Now, I’ll tell you, it got really frustrating as every day mounted and it became crystal clear to anybody with an open mind that this whole thing was a hoax, that they didn't see it. And after a while it became obvious to me they didn't want see it. A lot of Republicans did not want it to be untrue. So "Finish the Wall." It will be fascinating to see what the president does, particularly after listening to the salient advice he got from me on this program today.